Marathon, half marathon, 10k eller 5k? The marathon, half marathon, 10k and 5k start and finish in Fjällnora by the lake Trehörningen. 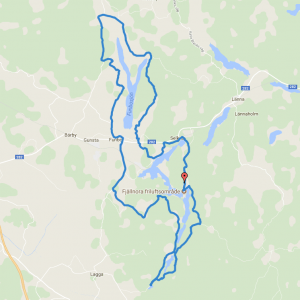 The 5k encircles the lake Ramsen, exciting forest trails and lovely lake views. The marathon, half marathon and 10k are mostly flat. These three courses shows you a typical Swedish landscape, dominated by forests. You will run mostly on quaint gravel roads with some brief forest trails and asphalt. All courses are well marked and there is no need for a map or remembering the route. These description is just here for those of you who are more curious than others. Forest and adventure, trail run for both adults and kids. This is the only course heading south for a start. A quick run on the gravel road for a few hundred meters will take you to an exciting forest trail leading you along the eastern side of lake Ramsen. The trail leads you among pine trees and rocks, you have to choose between looking at the views or where you are stepping. This is no place for breaking personal records on 5k. Some parts are tricky, and the distance is actually 5.5 km. From the eastern shore the trail makes a detour deeper in the forest before leading you down to a small wooden bridge with a lovely view of lake Ramsen to the north and lake Norrsjön to your south. Here you will find the aid station. The track goes through dense bush vegetation two hundred meters, turn right and follow the shore. You will enter the forest again and you will soon come to a steep ascend to the high western shore. Another up and down and soon you will reach Pålsundet, a strait between lake Ramsen and Trehörningen. Normally people pass here by dragging a raft connected to both sides by a chain. On race day we have a temporary bridge here. You run e few hundred meters on the isthmus and you are reaching the goal. 85% forest trail, 15% gravel road. Some short but steep hills. 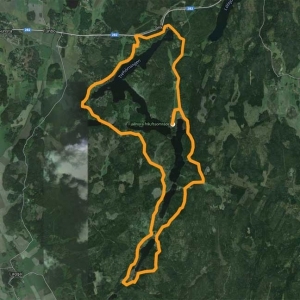 This course is actually 10.8 km and will take you around lake Trehörningen counter clockwise. The course is flat with just a few small hills. Starting north you will have an easy run on a pleasant trail and for a while on the asphalt road. A soft trail and gravel road leads you down between summer houses to the lake Trehörningen. Here you will find the first aid station. Please beware that you will cross the railroad. There are only museum trains on these tracks, but they cannot stop on short notice. The rule is simple: Never run in front of trains, not even slow ones. A gravel road with some short hills leads you up to the main road, 282. Do not cross the road, after some 30 meters you will continue down in the village Marielund. You will run among characteristic summer houses from the early 1900’s. At the train stop Lövstahagen you will find the next aid station. Here the marathon runners continue to the right, you just keep on straight forward. Another kilometre or so and you will reach Marielund station and another railroad crossing. Same rule applies: Don’t run in front of trains. Here starts a stretch of asphalt. Reaching the Marielund farm you will turn sharply left down to the ponds. The farm, ponds and the houses in this area are a property of the Marielund mansion. (There is a lovely 17thcentury mansion further down, by the lake Gårsjön). Another sharp left turn and you will begin a long gravel road through the forest with occasional small old, wooden houses. Along the road you will find an aid station at the place where the marathon runners will make you company for a while. However, you will only meet them here if they are elite runners and you are taking it slow. In the tiny village Skräddartorp you will turn left, the longer distances keep heading on.Here you will run along a long, grassy meadow. The grass is taken down, but if you are tired you might find the soft ground challenging. At the end of the open meadow, you are back in the forest, but there is actually just 200 meters with one or two turns and and a short hill. The short hill ends with a two meter drop, so be careful. 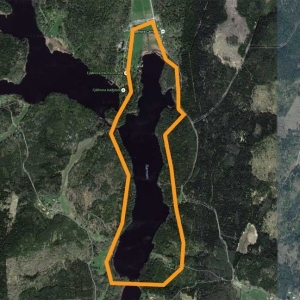 Here you will meet the 5 k trail and you are at Pålsundet, a strait between lakes Trehörningen and Ramsen. Normally people pass here by dragging a raft connected to both sides by a chain. On race day we have a temporary bridge here. You run e few hundred meters on the isthmus and you are reaching the goal. Flat course with some small hills. 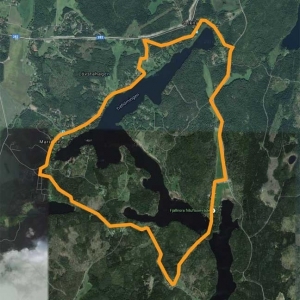 These 21,1 km will move you around four lakes counter clockwise: Trehörningen, Ramsen, Norrsjön and Edasjön. The course is flat with a few hills, two or three are larger hills – but don’t worry – there are no mountains. You will keep yourself between 10 and 50 meters above sea level. Starting north you will have an easy run on a pleasant trail and for a while on the asphalt road. A soft trail and gravel road leads you down between summer houses to the lake Trehörningen. Here you will find the first aid station. At the train stop Lövstahagen you will find the next aid station. Here the marathon runners continue to the right, you just keep on straight forward.Another kilometre or so and you will reach Marielund station and another railroad crossing. Same rule applies: Don’t run in front of trains. Here starts a stretch of asphalt. Reaching the Marielund farm you will turn sharply left down to the ponds. The farm, ponds and the houses in this area are a property of the Marielund mansion. (There is a lovely 17thcentury mansion further down, by the lake Gårsjön). Another sharp left turn and you will begin a long gravel road through the forest with occasional small old, wooden houses. Along the road you will find an aid station at the place where the marathon runners will make you company for a while. However, you will only meet them here if they are elite runners and you are walking. In the tiny village Skräddartorp you will continue straight forward while the 10k-runners turn left. Soon you will arrive at the aid station Norredatorp, a small homestead at the end of the road – now belonging to the students of Uppsala university. You will continue on a forest trail along the shore of lake Norrsjön. Another gravel roads starts here and brings you to the village Eda, and you are about to run around the fourth and last lake. After Eda there is another kilometer of gravel road through deep forest and you reach the next aid station at the nameless lake where some red water lilies grows. You turn back a few hundred meters the same way you came and down to your right. Your way back to Fjällnora will be on the east side of the lakes Edasjön, Norrsjön and Ramsen. After a small gravel road and a long hill you will run one kilometer along a small forest track where you find the next and final aid station. You will pass some old houses, get some lake glimpses and continue through forests all the way to Fjällnora and finally your goal. The last kilometres will feel a lot easier when thinking of the awaiting swim after finishing. These 42,2 km will move you around six lakes counter clockwise: Trehörningen, Funbosjön, Gårsjön, Ramsen, Norrsjön and Edasjön. The course is flat with a few hills, two or three are larger hills – but don’t worry – there are no mountains. You will keep yourself between 10 and 50 meters above sea level. At the train stop Lövstahagen you will find the next aid station. Here the marathon runners continue to the right.A short forest trail (less than one kilometer) brings you the small village Källtorp. After that you will cross the main road, 282. Please be careful! We do have a guard, but they cannot guarantee that cars will stop. On the other side a nice neighbour cut the grass making it easy to cross a meadow. Running around lake Funbosjön is quite a long stretch, but a nice one. Starting on the eastern side you run past the 17thcentury mansion Hallkved. About two km asphalt and another forest trail for about one kilometer. There is an aid station here. The course continues through a mixed agricultural landscape. Beginning with small cottages you will see how the farms get bigger until you will reach the Frötuna mansion – once they ruled a large part of this area. At Frötuna you find the next aid station in beautiful setting. Heading west you will reach the asphalt road going south. Another kilometer or two of asphalt leads you to a sign “Funboslätt” where you turn left. This is a new stretch of the course for 2018. It will give you another glimpse of the road and more variation. You will run to the next aid station at a small lovely cottage. After that you will follow historic village roads (some no longer in use) further south. More open landscapes and you will reach the 12thcentury Funbo church where the next aid station is located. You cross the 18thcentury stone bridge and then you need to cross the main road 282 once again. We have got a guard – but please be careful, tired runners and traffic is a bad mix. Some drivers just won’t slow down. Continue on asphalt roads through a lovely open landscape to the next aid station, Söderby såg. Here you will continue on gravel roads between forests and farms until the next aid station. Here you will be back on the same track as your fellow runners for the shorter distances. In the tiny village Skräddartorp you will continue straight forward while the 10k-runners turn left. Soon you will arrive at the aid station Norredatorp, a small homestead at the end of the road – now belonging to the students of Uppsala university. You will continue on a forest trail along the shore of lake Norrsjön.